This bike-shaped multi-tool holds keys, pops bottle tops, and slips conveniently onto your belt loop. A pocketful of keys can be heavy, bulky and uncomfortable. That's why Michael Khamsot invented this handy multi-functional tool that not only keeps your keys organized and tucked away, but even keeps your prepared in an emergency. It starts with a stainless steel cast, stone tumbled and hand-finished for smooth, rounded edges. The eye at one end allows you to include bulky keys, such as some car keys, via the included keyring. The opening on the other end allows you to slip it seamlessly onto your belt loop. In addition to all of that, there's even a built-in bottle opener, for refreshment emergencies. Made in Portland, Oregon. I am a product designer and owner of Vixay Design. Our philosophy is "Stuff made in Oregon rocks!" We're excited to be in the good company of those who have chosen Oregon as the place they want to live and work in. Being able to make and sell my products here means a lot to me. I'm proud to be involved in designing, prototyping and finally experiencing my products being manufactured in the community I am a part of. It's a joy! Great gift for a biker! Useful and meaningful as a gift! Retirement gift for an cycling enthusiast. Handy and thoughtful. Absolutely love the multi purpose bike key chain. We gave this as a gift to our son as he gets ready to bike across the state of Virginia for MS. Gave this to an avid bike rider. It was the perfect gift and useful as well. Thanks for offering quality items that are unusual,fun and affordable. Contractor breaks shoulder while biking. 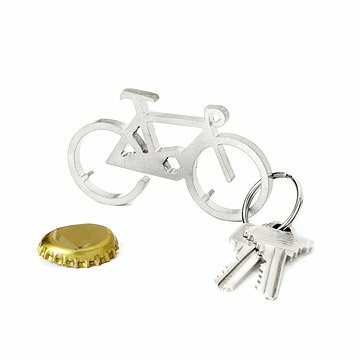 Bought this item to give to our kitchen remodel contractor so that he will remember to take care while riding his bike and to remember us when he uses the key chain.